WinZip is the best file compression tool when working with the ZIP format. 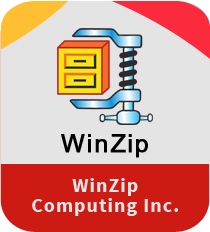 Developed by WinZip Computing Inc., the tool lets you manage all your ZIP files from a single place. The compression tool features a centralized file management system that lets you access files present on any local, network or cloud location. Other than ZIP files, WinZip also allows you to decompress other popular archives, including 7Z and RAR. It even allows you to create ready-only PDFs for providing documentation with the compressed files. You can also add watermark to the PDFs for avoiding copy problem. The compression tool lets you back-up all your archives to cloud using its Job Wizard Super Picker utility. You can also store the created back-up on your device. WinZip even allows you to automate the back-up process, and send you notification via mail and SMS once the task is completed. WinZip is one of the best system tools for file conversion too. You can easily select settings and apply them to all the files or a single file in an archive. For enhanced security, you can add a watermark with data/time stamp to all your PDFs, photos, documents, and other files. > File Manager – WinZip features a robust File Manger utility, which lets you easily take care of all your files. It offers a number of options such as selection, deletion, copy, share, etc. > Background Tools – WinZip comes with a set of junk management tools known as Background tools that keeps you aware about old files, unused files, and Recycle Bin files. You can easily remove all these files with a single click. > Inbuilt PDF Convertor – WinZip lets you convert files to PDFs and store them in a zip file. You can easily share these PDF files using popular sharing services. > Unzip and Try – Preview a zip file before extracting. WinZip’s unique Unzip and Try feature lets you review content of a zip file before actual unzipping. > WinZip Email – WinZip’s inbuilt email feature lets you connect your email accounts with the file compression tool for easy sharing. > ZipShare access – ZipShare is one of the leading sharing services that makes it easy to share huge zip files. > WinZip supports almost all popular sharing services, including social media channels, Office 365 Groups, Instant Messengers, Google Talk, and Jabber. > Device-optimized UI – WinZip features a highly adaptable UI that adjusts itself according to the device, notebook or PC, you are using. It also provides a touch-friendly interface for touchscreen devices. > Unzips 7Z, RAR, XZ, and other popular archive formats. > Powerful file management system allows you to create zip files at any cloud, physical or network location. > Cannot create 7Z, RAR, XZ, etc. archives. > Not available for Windows XP. WinZip your best bet for dealing with all types of ZIP operations. Download WinZip now and take control of all ZIP files. It is the best file compression utility..has powerful AES encryption..